Improve your memory by playing with your favorite pictures! The goal of this game is to find pairs of identical cards. Your children can also play, even the youngest children can enjoy this game with animal cards, Disney cards and other attractive designs. Improve your memory by playing with your favorite pictures! This game is fun for all people from ages 3 to 103! With the vanished mode, paired cards vanished, so it's easiest to complete the game. Banished mode is an Easy MEMOry Pro option. With Easy MEMOry Pro, you have the option to find pairs of identical cards OR pairs of different cards. You can play a variety of games with each of the card sets by matching pairs of cards, or even groups of up to 5 cards. Young players can match the picture of an animal with the sound it makes, or the name of an object with its picture. Older players can try to match the eyes of celebrities with their names. Since this game is fully customizable, you can create your own addons! Let your imagination run wild - create an unique addon and play! You can also play against your best friends and your children! Have a friendly competition - find out who has the better memory! Do you want to train yourself? Play against the computer. There are 4 difficulty levels for you to choose from (Expert, Advanced, Beginner and First game). With Easy MEMOry Pro you can also play against a computer in teacher mode - the program will adapt to your memory level to help you boost your skills! If your memory is really good, increase the difficulty and make groups of three or more identical cards. You can download and play with new sets of pictures, which are added to this site every month. You can also create you own game addons and submit them, we will add them to the site. You create or play with even more advanced game addons. On these addons, cards can be associated with text displayed on the left of the screen see photo on the left), or in a new window. addons can have their own buttons, background pictures and final screens. Learn more with the Easy MEMOry step by step tour! 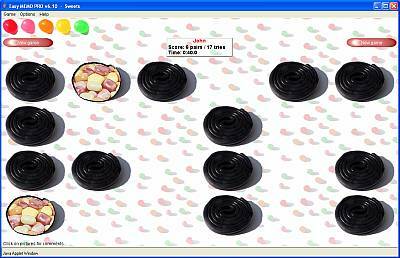 Easy MEMOry Pro is a shareware program. This means that you may try the program for free on the official website. If you decide that you want to use it offline, you must register it and buy the full version and obtain an End User License. If you want to post Easy MEMOry Pro online on your own website, you could contact us for more information. The author retains the ownership rights to the game and unauthorized modification is strictly prohibited. 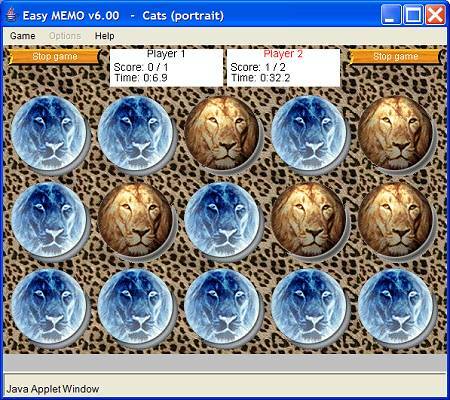 Easy MEMOry is a freeware program. This means you can play and make copies of it without profit. The author retains the ownership rights to the game, and unauthorized modification is strictly prohibited. For commercial or online use, you need to buy Easy MEMOry Pro.